A captivating and enthralling performance, highlighting the amazing skill of the artists. Enhanced by the intricate costumes, spectacular lighting and multimedia projection, creating a visually stunning performance. Backed by Rüdiger Oppermann’s evocative soundtrack, transporting you from the sea and sky to the barren desert. Creating a wonderful sensory atmosphere full of depth. 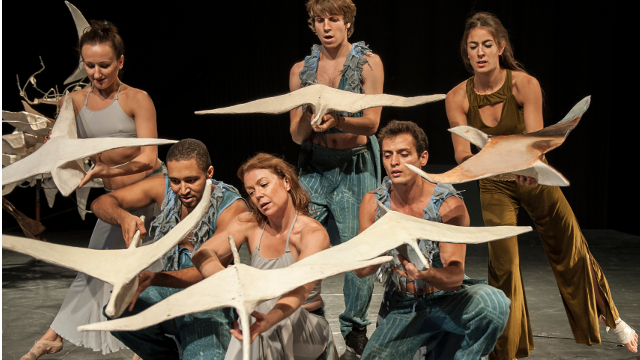 Wings in My Heart focuses on Marula Rigolo’s story, as she pursues the family tradition of circus and “Balance” performance. With each act signifying a different part of life. Dramatically beginning with Marula bursting out of a lake of fire and water. Following her journey in a show full of amazing aerial acrobatics, dance and physical theatre. Including a jaw-dropping counterbalance rope act and an intricate swinging pendulum routine that traverses the entire stage. The performance concludes with the breath-taking Sanddorn balance act. Leaving the audience on tenterhooks right until the very end. Wings in my heart, Fountainbridge (Venue 347) between the 7th-30th Not 24th August At 20:00 Find out more and get tickets here.